Building a hospital and providing healthcare service are essential parts at any times and places. In the internet-based society, along with these two activities, it is necessary to create a online site for people to seek for health service they want. However, one posed question is that among an ocean of numerous WordPress medical themes, which theme is the most ideal for one medical website to stand out against others. If that question is puzzling you, this article will help you undo that tangled knot. Herein this article, 8 newest and most incredible WordPress medical themes will be presented so the range of choices is much lessened. These medical templates are all plentiful in theme features, specialized for healthcare websites and captivating with clean, neat and contemporary look. Because they are all perfect, let’s check their live demos to see which design fits with your style most and then reach the last decision of purchase. 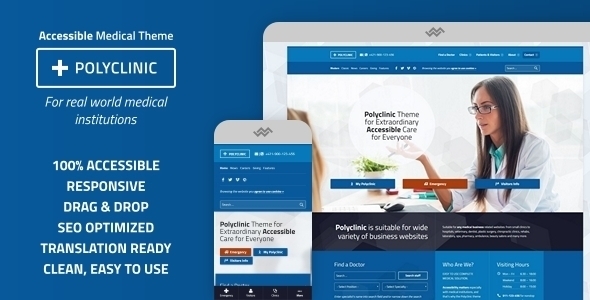 Polyclinic is a fresh-faced stunning theme among a wealth of WordPress medical themes. 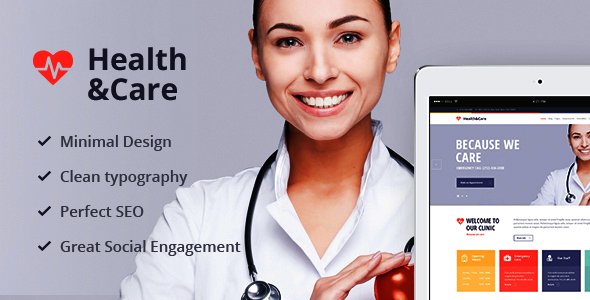 This medical & health theme is a perfect solution to real-world clinics and hospitals. That is because the main focus during the theme development was put into making your website content readable and accessible – the theme is optimized also for visitors with disabilities, because of accessibility matters, especially with medical institutions! Polyclinic possesses a package of many praise-worthy features. The theme is fully GPL licensed, fully customizable via native WordPress theme customizer (with live preview of your changes), supported with the best page builder plugin (the Beaver Builder), and is responsive and incredibly mobile – friendly (contains unique mobile menu) and SEO optimized (Schema.org microformats included), high resolution (Retina) displays ready, translation ready and print ready. Moreover, there are so many more other outstanding features. Let’s check Polyclinic’s Live Demo for more details. 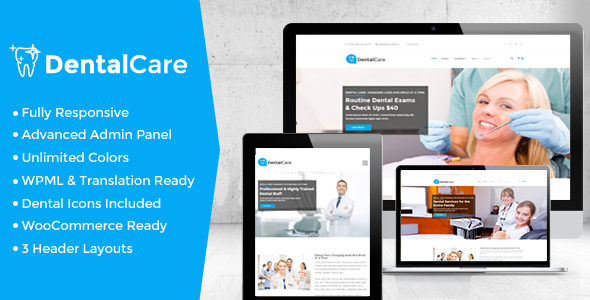 Dental Care is a clean and modern WordPress medical theme. This health theme targets dentists, dental practices, dental clinics, dental hygienists, orthodontists, endodontists, health clinics, doctors, oral health care providers and any other health and medical organization. A collection of Dental Care’s great features is various. Dental Care features a responsive mobile-friendly design powered by Bootstrap 3 that looks great on all devices. Dental Care is packed with functional and targeted features for dental and medical practices. Such as listing for services and team members, different types of galleries for displaying any photos, testimonials, appointment booking functionality and opening hours. Dental Care also features a powerful theme options panel and additional page and post meta options that make it very easy to customize many aspects of the theme with just a few clicks. No coding skills are required. Besides, Dental Care is characterised by some outstanding theme features that can save you a great deal of money such as Visual Composer ($34 saved), Revolution Slider ($19 saved), Appointment Booking System ($34 saved), Ultimate Addons for VC ($18 saved), WooCommerce Ready, Built-in Mega Menu, One Click Demo Importer, Dental Icons Included and Translation & WPML Ready. To know this medical theme inside out, take a look at its live demo here. Medicare functions to exclusively serve health, medical, clinic, dental or veterinary services websites. Since tailored for health and medical business organizers, Medicare is packed with carefully selected and crafted features. Thanks to being fully responsive and retina – ready, Medicare responds elegantly to various screen sizes and has been tested to work across devices, from the largest of desktops to modern smart phones. Medicare offers comprehensive options panel, unique page transitions and distinctive typography and customizable quote calculator. It also includes easy-to-use and fast page builder. With one click import users can get their websites ready in minutes. Some other dominant theme features are Rapid Composer ($34 saved), Child Theme Ready, Book Immediately, Cost Calculator ($20 saved), Translation Ready, Google Fonts, WP Customizer and Online Shop with WooCommerce. Take some time to watch its live demo here. 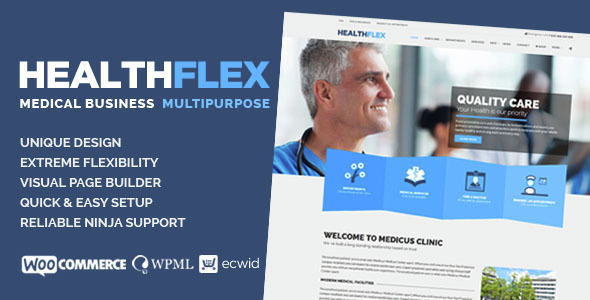 HEALTHFLEX is a Premium versatile Medical & Healthcare WordPress Theme, focused on medical, wellness and other health related projects. 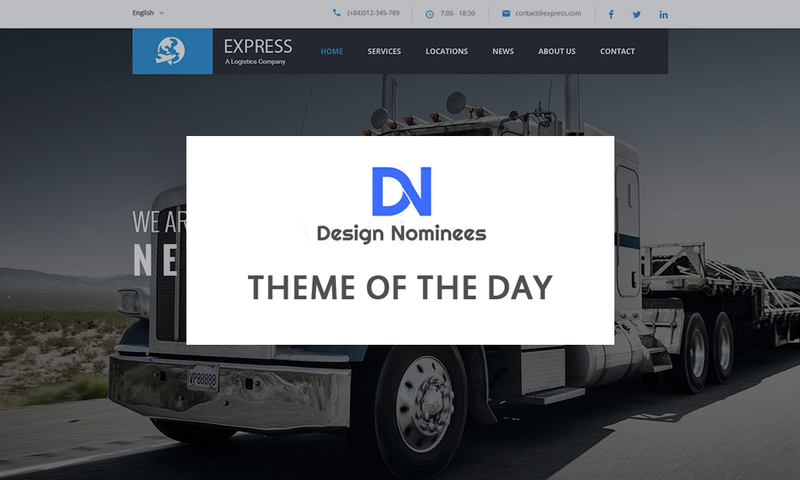 The theme’s flexibility shows in a way that it is suited for not only Medical Clinic, Healthcare Professionals, Health Care, Physicians, Doctors, Veterinarians, Hospitals, Health Clinics but also Diet & Beauty Specialists, Personal Trainers, Gyms, Yoga Professionals, Spa Salons and Barber shops or any business site projects. To serve such a diversity of distinct websites, HEALTHFLEX is apparently packed with a lot of great elements. The design is based on bold colors, fine typography, and large photography. It is fully responsive and optimized for speed on all devices and browsers. The theme includes special features like appointment forms, departments, services, price plans, team members, CV, testimonials, newsletter forms, knowledge base library and articles, news and many more! We should not miss out some following typical characteristics of HEALTHFLEX: Drag & Drop Page Builder, Extensive Theme Options, Unlimited Color Variations, Thematic Icon Libraries, Translation Ready, WooCommerce Ready, ECWID Shopping Cart Plugin, and Custom Post Type UI Ready. Let’s glimpse through HEALTHFLEX’s live demo here to see whether this design suits your style. 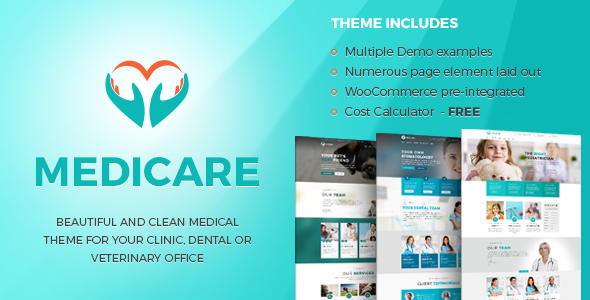 iMedica is a comprehensive WordPress theme made for medical organizations. iMedica is very feature-rich. 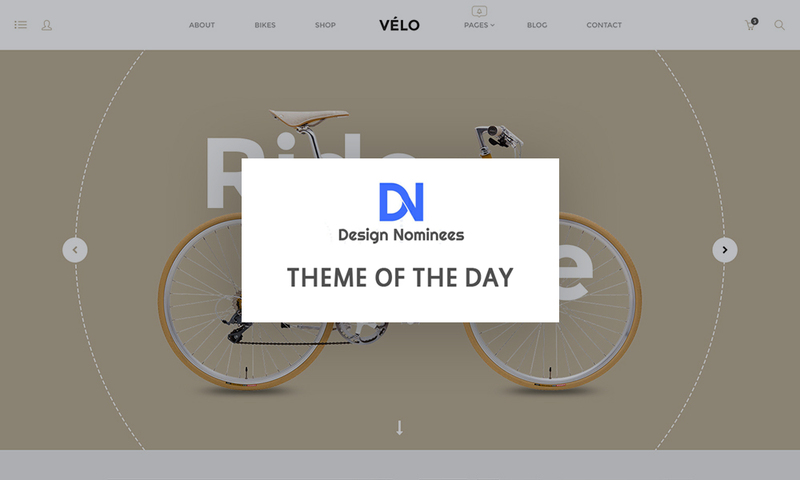 This medical theme is responsive & retina ready and owns a lightweight framework & a very flexible structure. 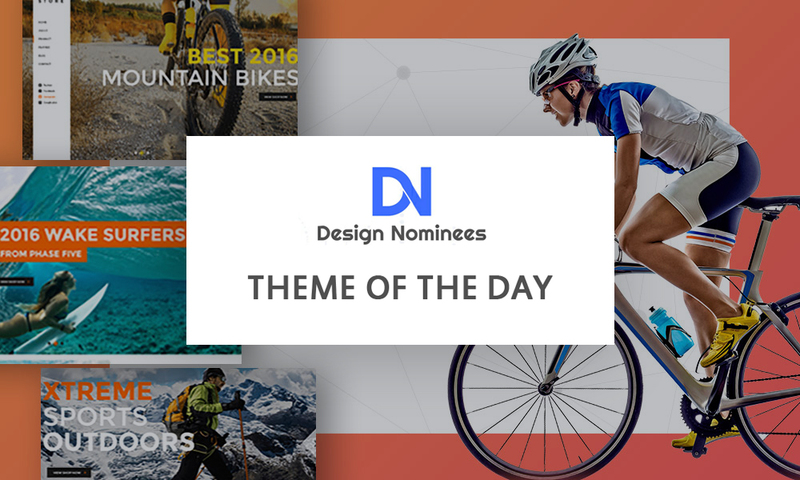 The theme comes with 9 new demos with 20+ ready homepages. The core of iMedica is a smart & simple Drag & Drop Page Builder so adding rows & columns and elements in them needs no touching a single line of code. A brief list of other features includes Advanced Admin Panel, Header Option, Full Width Boxed & Fluid Layouts, Built for Speed, SEO Friendly, Unlimited Design Options, Unlimited Font Icons & Sidebars, CSS3 Animations, Revolution Slider and Visual Composer and much more. 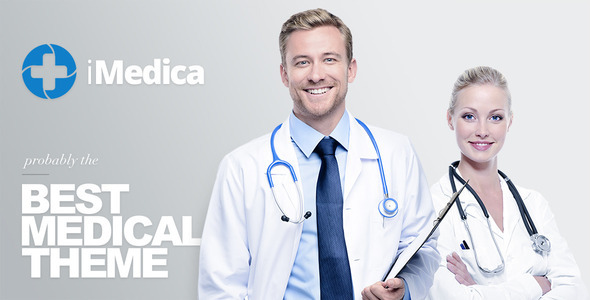 To sum up, from Parallax backgrounds to Before/After Slider, from Timetable plugin to Slider Revolution Slider, everything is gathered in iMedica for users to build the most awesome medical website. 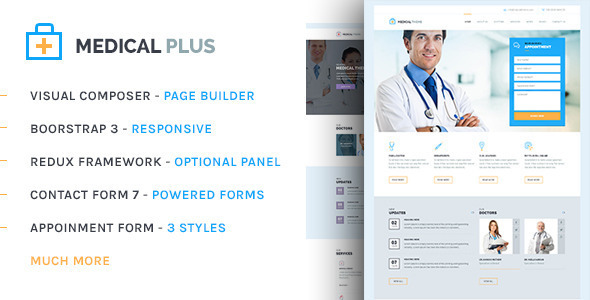 Health Plus is a fully dynamic, well structured and beautiful WordPress theme which is specifically designed for hospitals, health clinics, dentists and health service – related websites. The theme is responsive and built with Bootstrap 3. This theme has features to manage appointment forms, services, doctors, doctors’ timetables, contact forms, faq’s, testimonials and all with beautiful font awesome icons. Some outstanding great features are Full Width & Boxed Style Layout, Contact Forms, Appointment Forms, Fully Translatable with .Po and Mo files, WPML Plugin Compatible, Extensive Online Documentation, Font Awesome Icons, and Child Theme & Demo Data Included and etc. 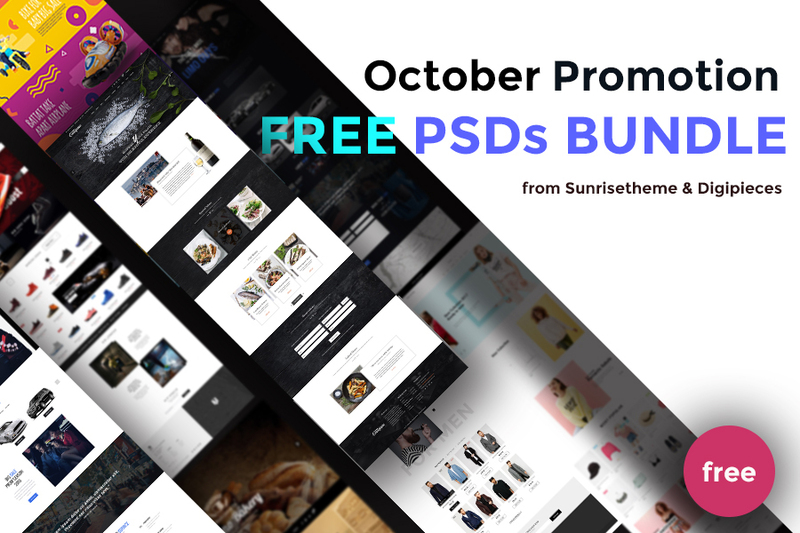 Additionally, there are free-of-charge plugins included in this theme: Visual Composer, Revolution Slider, Contact Form 7, and Redux Framework. These plugins will work very effectively to support building a stunning website easily. 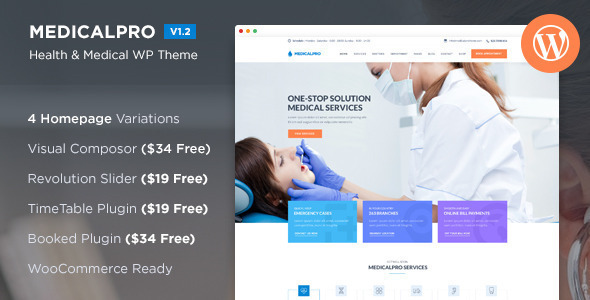 MedicalPro is a fully dynamic, well structured and beautiful wordpress theme for Health and Medical websites. It is a highly suitable theme for doctors, dentists, hospitals, health clinics, surgeons, gynecologist and other type of health and medical related organizations. In line with other awesome medical themes, MedicalPro possesses special features to manage appointment forms, services, doctors ,department, timetables, contact forms, newsletter and testimonials. The theme feature collection includes Fully Responsive, Homepage Variations, 12 Unique Page Templates, Easy & Extensive Theme Options, WooCommerce Ready, Detailed Documentation, Multilanguage Support with WPML.org, Unlimited Colors & Fonts, 15 PSD Files Included, and One Click Demo Import and etc. Moreover, it is a great chance to save nearly $100 with free amazing plugins included in the package, namely Booked Appointment Booking, Timetable Plugin, Revolution Slider and Visual Composer. Don’t hesitate to verify the features mentioned above here. Health & Care is a perfect solution for any medical and healthcare-related business, such as hospitals, research centers, clinics, dentists or pharmacies. The modern industrial design is very flexible and customizable for users to install, run and update easily. Healh & Care powers advanced theme options and media content manager. The theme is built with Revolution Slider,Booking Calendar, Appointment Calender, Essential Grid, PO Composer and Visual Composer. A number of different core great features are One Click Demo Installer, Mobile Device Optimization, SEO Optimized, Translation Options, Shortcode Builder, WooCommerce and Extensive Documentation, Custom Widgets Set and Override System and so on. Apart from its awesome features, what many customers like about Health & Care is that its authors provides customers with free support and updates. Check out the theme’s live demo here. Hardly anyone can deny these healthcare themes’ excellent features and resist their appealing appearances. If after considering their features and styles,you can not work out which one is the most suitable for your website among these 8 medical themes, let’s entrust the last decision with their prices. Note: If you have any interest in online business, here are top rated WordPress Online Store Themes for you to take into consideration.